When you open Excel, you will find a ribbon at the top of the screen. The ribbon is divided into tabs. Each tab is then divided into groups of icons. Not all information can be added into ribbon because it would take too much space. For that reason, in many groups, the additional button, called dialog box launcher, is added in the bottom right corner. Let’s take the Alignment tab as an example. 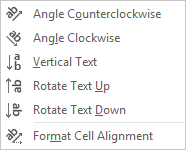 Under the Orientation icon, you will find a few propositions to rotate text. You can click one of them. But if you want to choose, for example, 30-degree text, you will have to click the dialog box launcher. 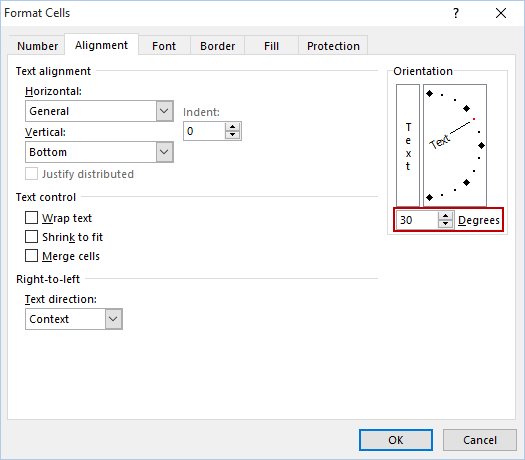 Click the icon in the bottom right corner of the Alignment group and set the percentage number. As you can see, now you have access to additional options, where you can choose additional parameters.